At approximately 60% more efficient than a condensing boiler a ground source heat pump is a great way to save money and the environment. 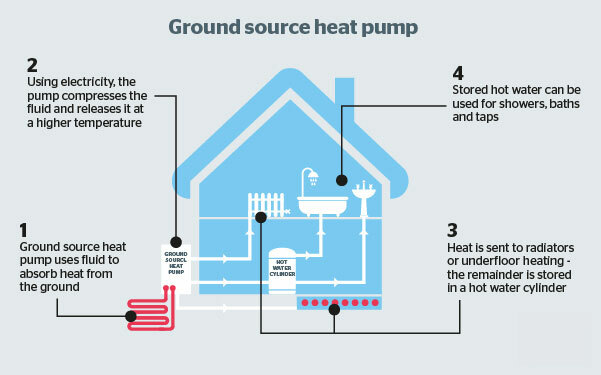 For every 1KW of electricity fed into an ground source heat pump you could get at least 4KW of heating energy out. Ground source heat pumps have unrivalled efficiency levels and contrary to popular belief you don’t require a field sized back garden to own one. With several groundwork options available we can install the required pipework in the tightest of spots. Have a look at the diagram on the left for a basic overview of how these systems work. Furthermore, by installing a ground source heat pump you will be eligible for the Renewable Heat Incentive or RHI scheme. This is a government initiative to reduce carbon emissions and reward households who move away from fossil fuels to heat their homes.Working in a similar way to the Feed-in-Tariff for solar photovoltaic (solar PV) systems, owners of heat pumps will be paid according to the total heat load of the property in kilowatt hours, for seven years tax-free. Check out our RHI page to see how much you could save.